A 50-year-old San Luis Obispo man suffered life-threatening injuries after driving off of Highway 154 in Santa Barbara County Wednesday morning. Shortly after 11 a.m., the man was driving a Ford F-150 on Highway 154 about three miles away from Highway 101. 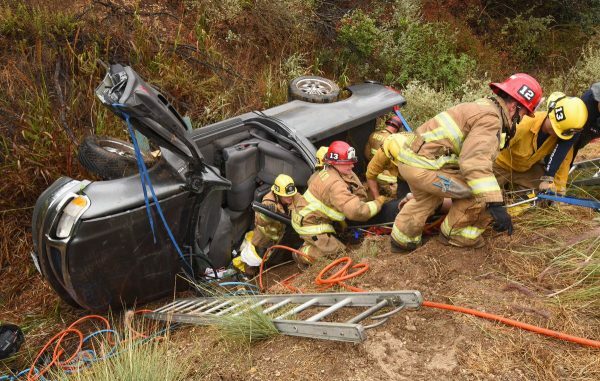 The driver lost control, and the pickup truck went about 20 feet off the road, going down an embankment and landing on its side, according to the Santa Barbara County Fire Department. It took emergency personnel a significant amount of time to arrive and extricate the man from the vehicle. The driver was then transported to Santa Barbara Cottage Hospital. The accident was one of multiple crashes on Highway 154 on Wednesday, which was impacted by the first rain of the season. A CHP investigation into the crash is ongoing. Authorities are withholding the name of the F-150 driver.